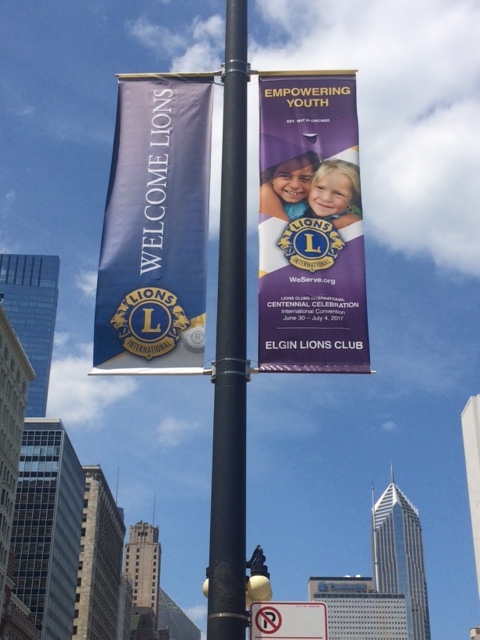 Chicago, Illinois–birthplace of Lions Clubs International–welcomed the Lions of the world to its 100th Annual Convention! 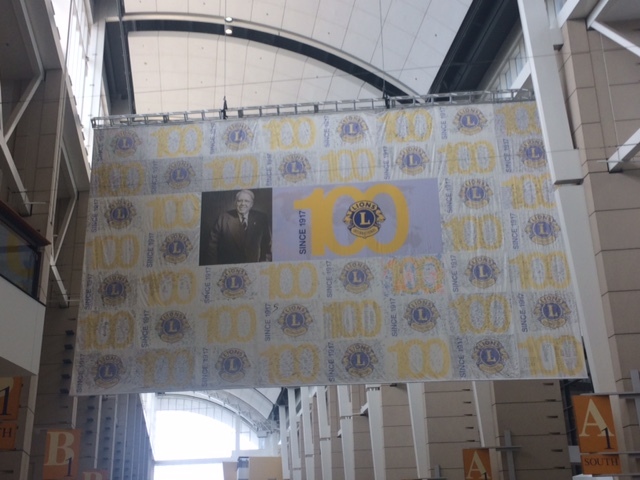 The past two weeks have been a blur of activity for Lion Kathy and me, as we participated fully in all aspects of the 100th annual convention of Lions Clubs International held in Chicago, Illinois. 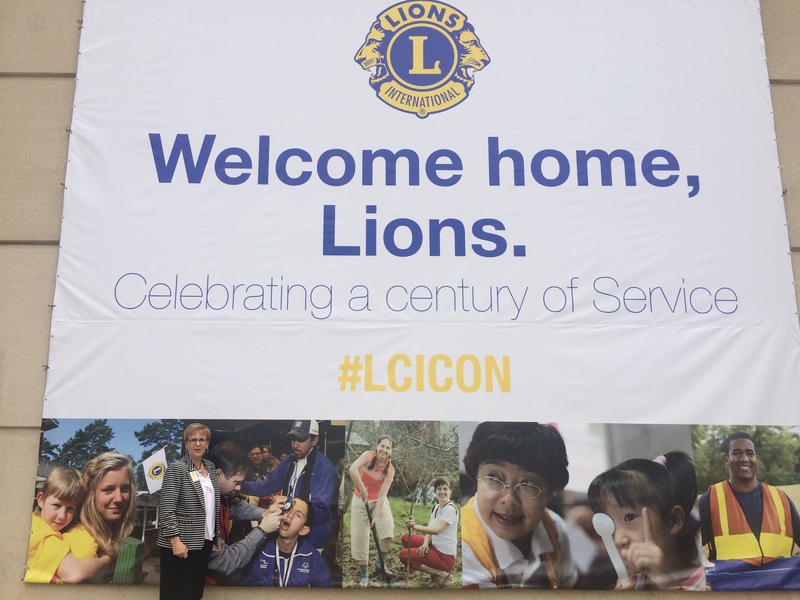 Over 30,000 Lions attended the highly-anticipated event and it was wonderful to greet old friends and make new acquaintances. Made of squares signed by Lions around the world, this two-sided banner hung from the ceiling of the McCormick Center with Founder Melvin Jones featured in the center. DGE Keith Zeutschel and ID Robert ready for one of the general sessions. LCI Staff did a wonderful job of developing interesting and vivid displays to inform Lions about the history of LCI. 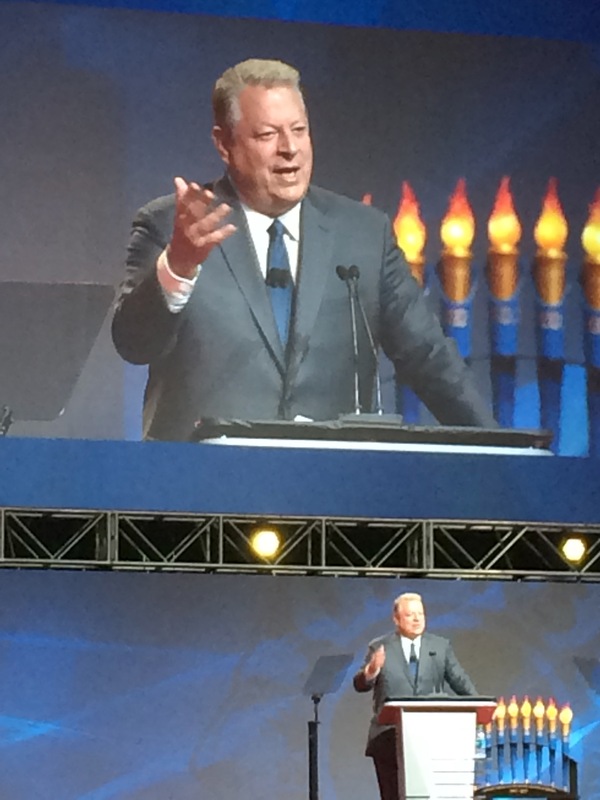 Former Vice President Al Gore delivers keynote address about protecting the environment–one of LCI’s centennial areas of service. The centennial flames from each Constitutional areas are displayed in the background. 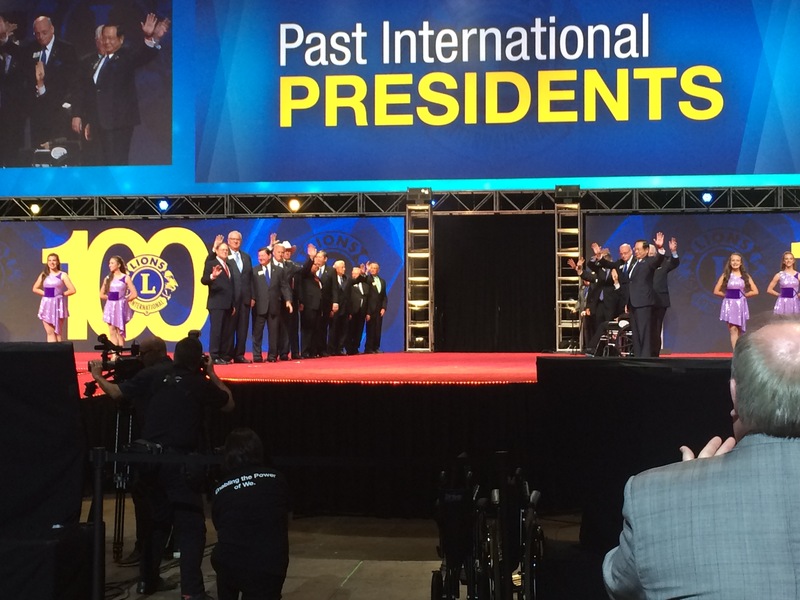 100th International President Corlew administers the oath of office to 101st International President Aggarwal. 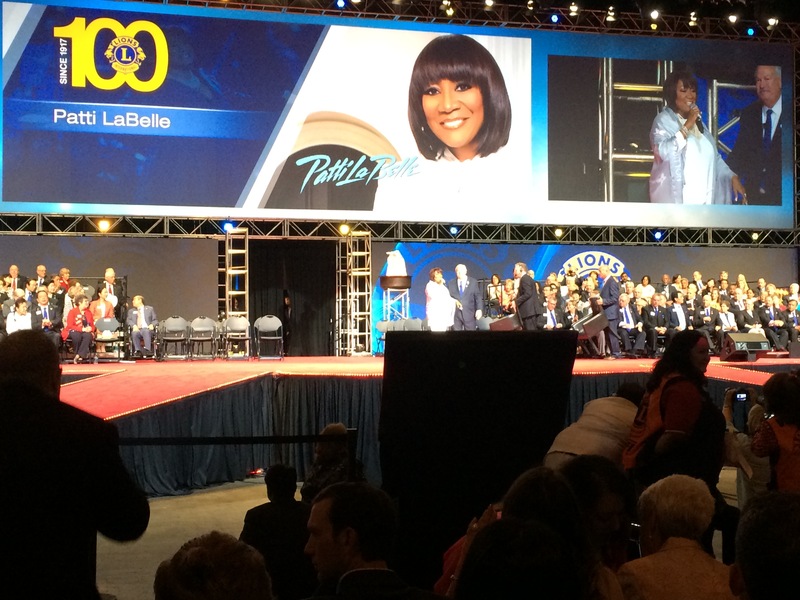 Let us share some of the highlights for us as we experienced this Centennial convention. The parade of flags representing the member countries of LCI. 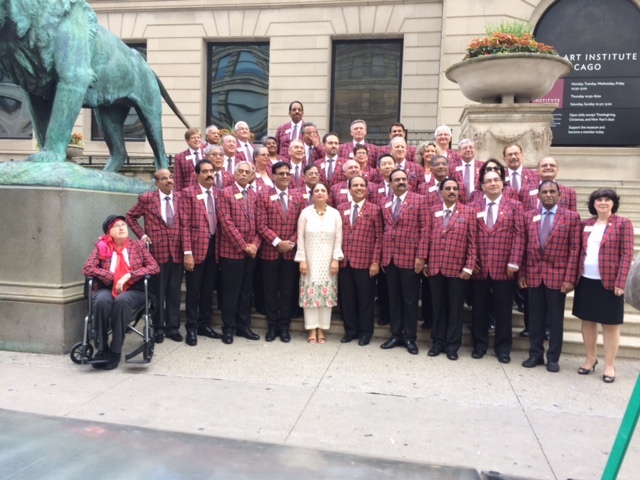 An historic photo taken on the steps of the Chicago Art Institute–recreating the signature photo of Melvin Jones and the first Lions Club members–with the 2017 DGE School Group Leaders and executives. 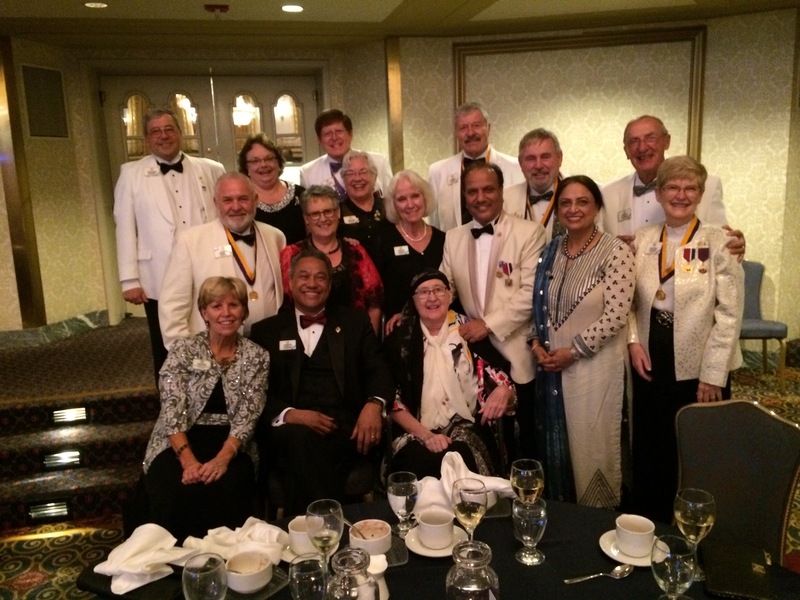 We began at the District Governor-Elect School, held the week before the LCI convention. Under the leadership of General Chairperson Sunil Kumar and Vice Chairperson Karla Harris, I was one of the 29 group leaders and specialists responsible for providing the final training for the incoming 750 Governors from every corner of the world. This is my group–the “Great Group 17 in 2017” –with our project. We were the only group with 17 (1917, 2017, 2117)! 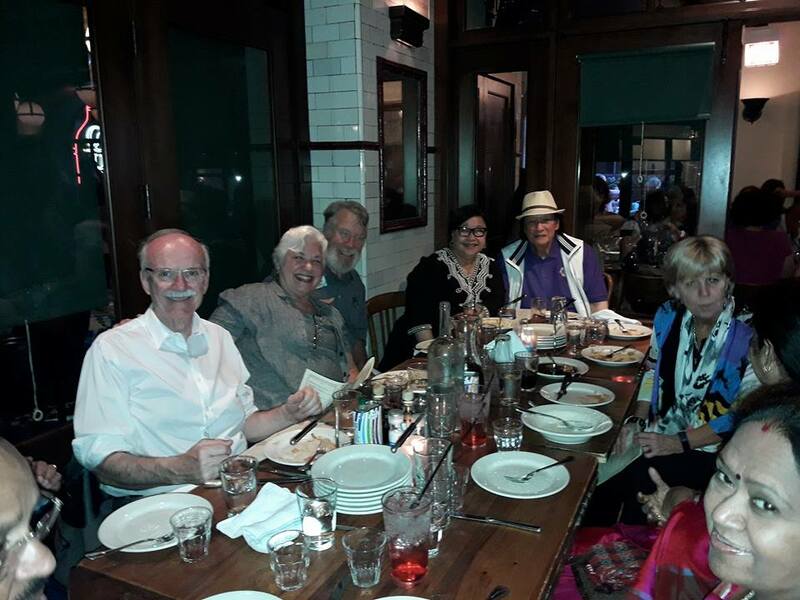 After having a personal meeting with incoming LCI President Dr. Naresh Aggarwal and his wife, Lion Navita, the DGEs, the group leaders, and all spouses/companions were treated to a welcome reception at Chicago’s Navy Pier. There, we worked on a project and enjoyed food and entertainment. 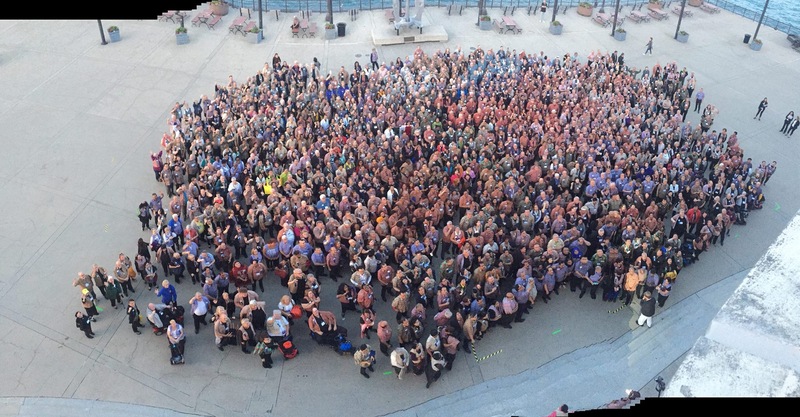 The group photo was taken at the water’s edge. Each day, the DGEs and their spouses or family members attended general sessions with motivational speakers. Nick Vujicic, a man born without limbs, spoke of the challenges he overcame and how no matter what happens, “if you can’t get a miracle, become one.” Sister BK Shivani, a spiritual healer from India, shared that “when ‘I’ is replaced by ‘we’ even illness becomes wellness.” President-Elect Naresh Aggarwal presented his international theme: “We Serve.” He also challenged the DGEs to always remember the Power of We, the Power of Service, and the Power of Action. 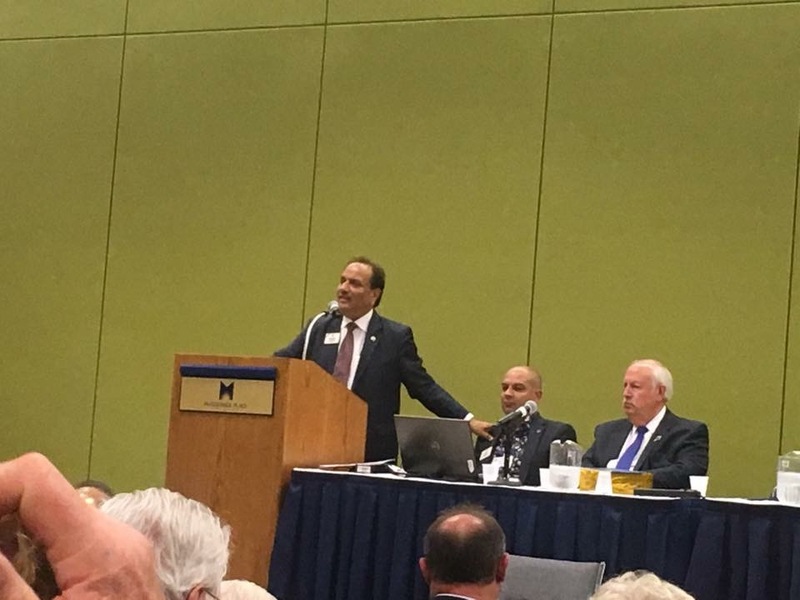 Soon-to-be-President Dr. Naresh Aggarwal shares his vision for LCI in the second century of service. 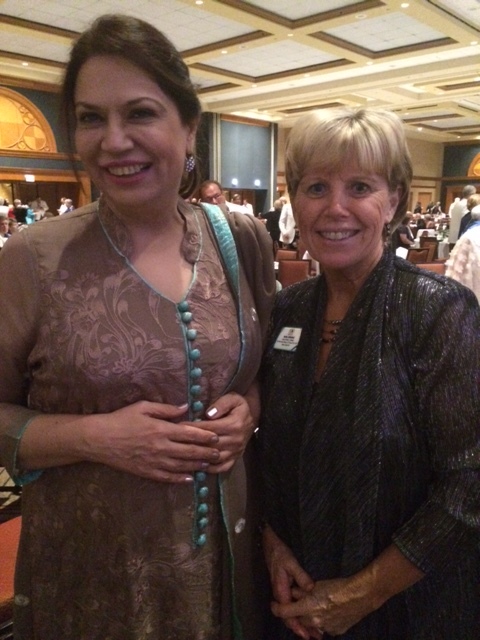 Lion Kathy had the opportunity to meet the first woman elected as an International Director, Nilofer Bakhtiar (1999-2001) from Pakistan. PID Bakhtiar spoke at the spouse/companion session. I felt at home in the training sessions, working with 32 DGEs from seven different countries: England, Iceland, Ireland, Malaysia, Thailand, Turkey, and USA. While the DGEs were dispersed over several groups, I was fortunate to have one of the future District Governors from my home Multiple District 5. I nominated DGE Keith when he ran for 2nd Vice District Governor, so it was very special for me to be the group leader for his final training before assuming his role as District Governor 5NE in eastern ND. So proud of our protege, DGE Keith Zeutschel of Horace, ND! My group was a great one–filled with enthusiastic leaders–ready to face the challenges ahead. 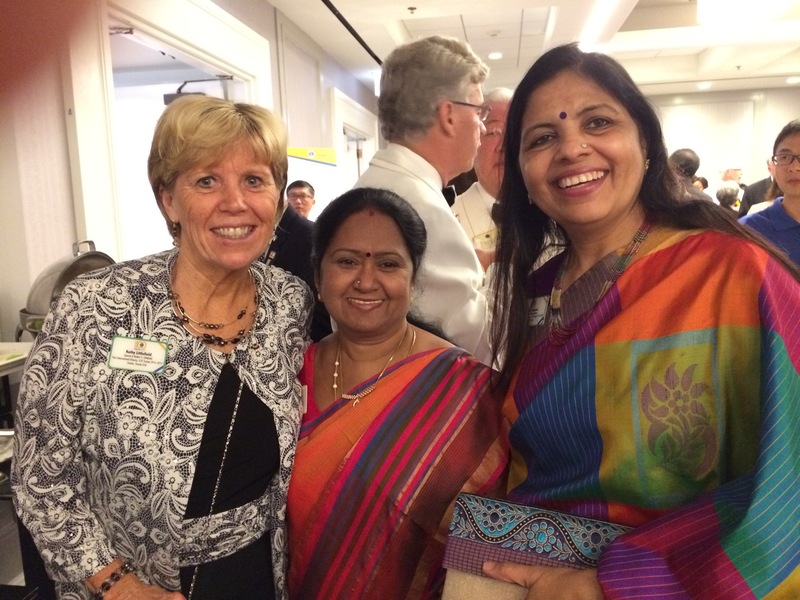 At the end of the week, a celebration banquet signaled the start of the new year of service for the DGEs. 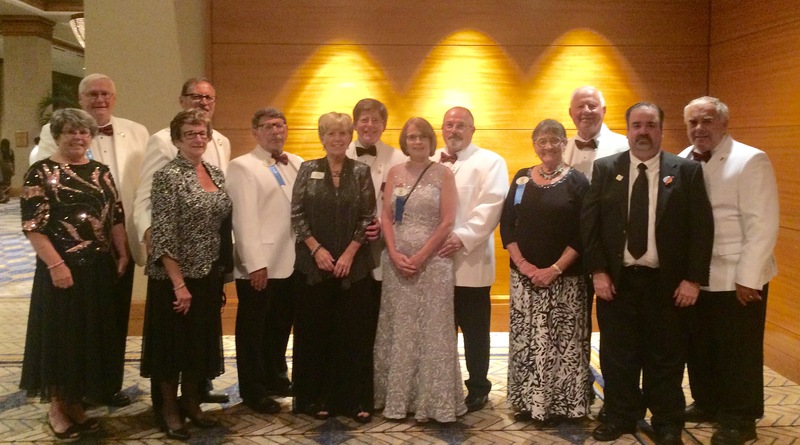 A great group of DGs and spouses/companions at the Celebration banquet. MD5 can be very proud of this group of leaders! 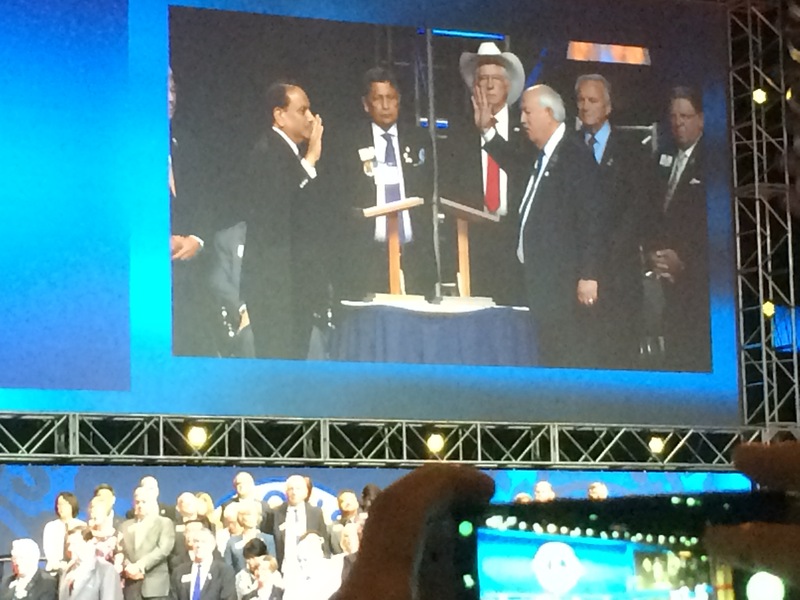 Then, during the final session of the convention, President Naresh Aggarwal administered the oath of office and the DGE blue ribbons were removed. My home MD5 can be proud of its six District Governors. They are well-prepared and served as great representatives throughout their training and convention. 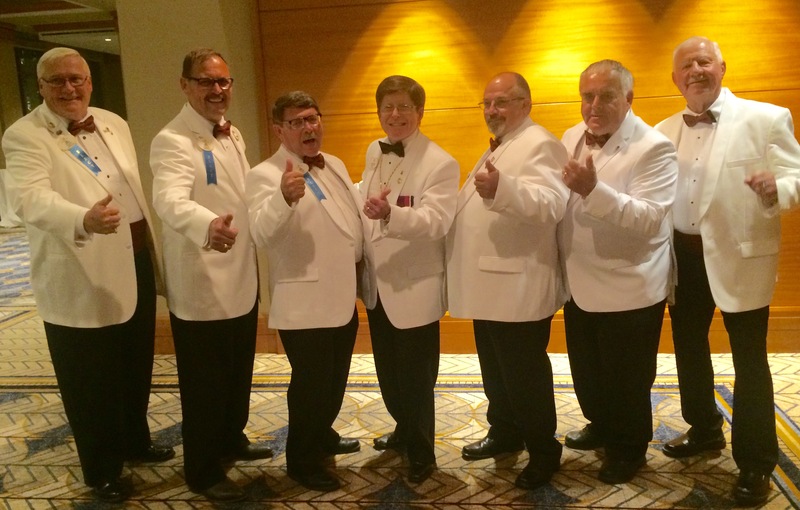 DG Terry McAleese, DG Dan Babyak, DG Tim Brown, PID Robert Littlefield, DG Gary Morel, DG Keith Zeutschel, and DG Neil Bowes give a thumbs up for a 101st year of Lions leadership! ID Candidate Pat Vannett (3rd from the left) is ready for service! 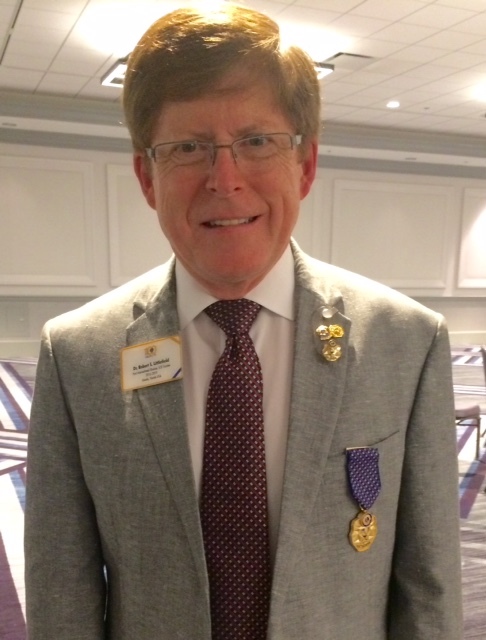 A second special aspect of the convention for Lion Kathy and me was helping Past District 5NW Governor Lion Pat Vannett of the Mandan Lions Club to make history on the Fourth of July by being elected to the International Board of Directors. 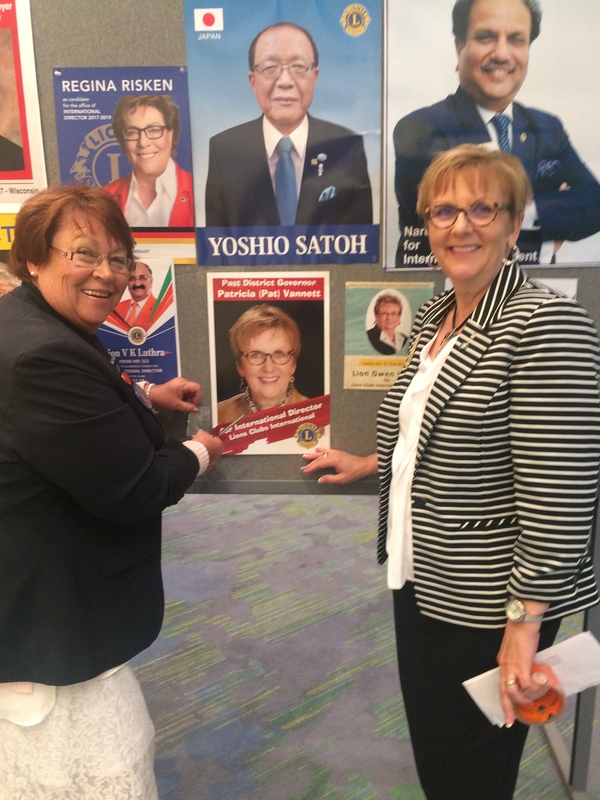 ID Pat is the first woman to be elected as an International Director from Multiple District 5. 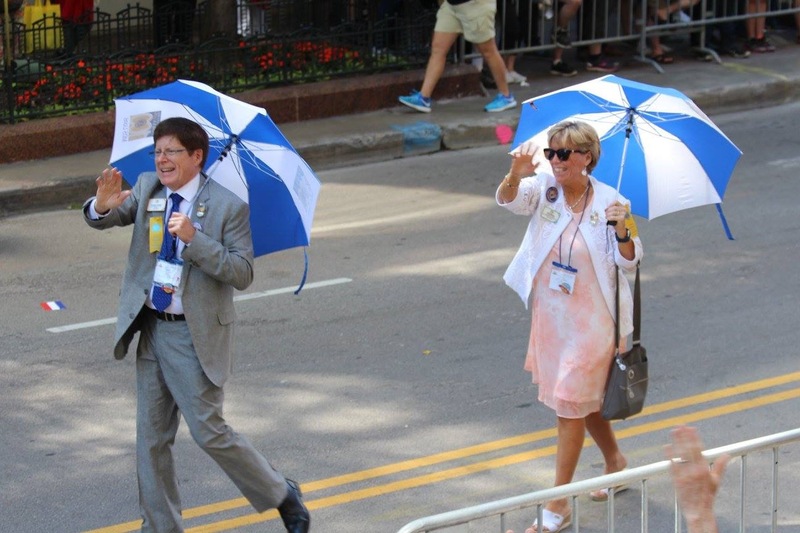 She and her husband, PDG Lion Kevin Vannett, will represent the United States for a two-year term of office. 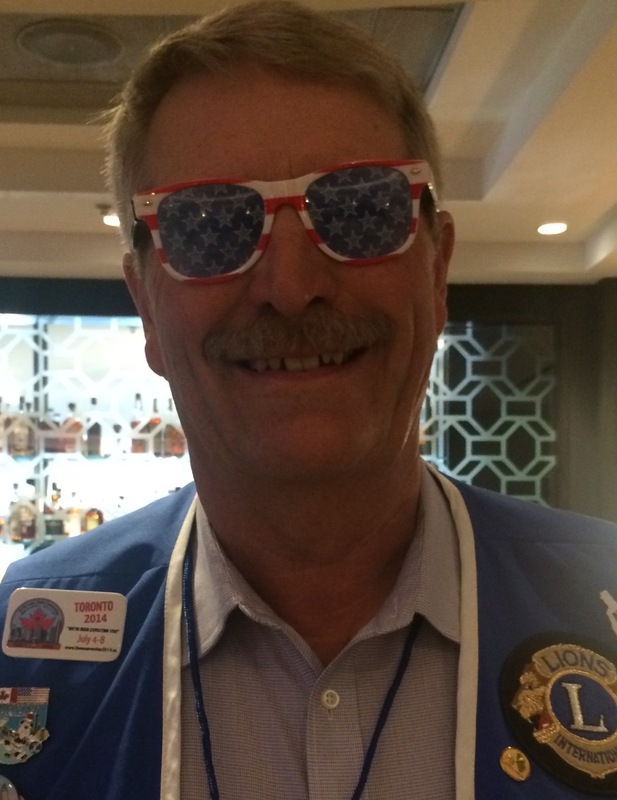 PDG Rob Hill celebrates the Fourth of July and ID Pat’s election! Campaign manager PDG Judy Beaudry is proud of her candidate, ID Pat! 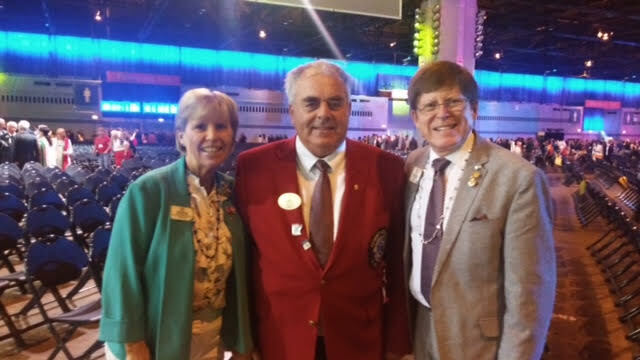 From the moment that her campaign committee arrived in Chicago, the events of the convention kept everyone in action: PDG Rob Hill (5-SKS) served has the head of her logistical operations making travel and scheduling arrangements; PDG Judy and Lion Mac Beaudry (5-NW) represented her on the LCI election committee; PDG Dave and Lion Linda Czywczynski (5-NW) served as the advance team; and Lion Kathy and I introduced PDGs Pat and Kevin at the area breakfasts and other meetings. Other Lions from MD5 in attendance assisted as their schedules allowed. I was so proud to know that four members from the NDSU Campus Lions Club were there distributing campaign materials to thousands of delegates at the convention headquarters in the McCormick Center. 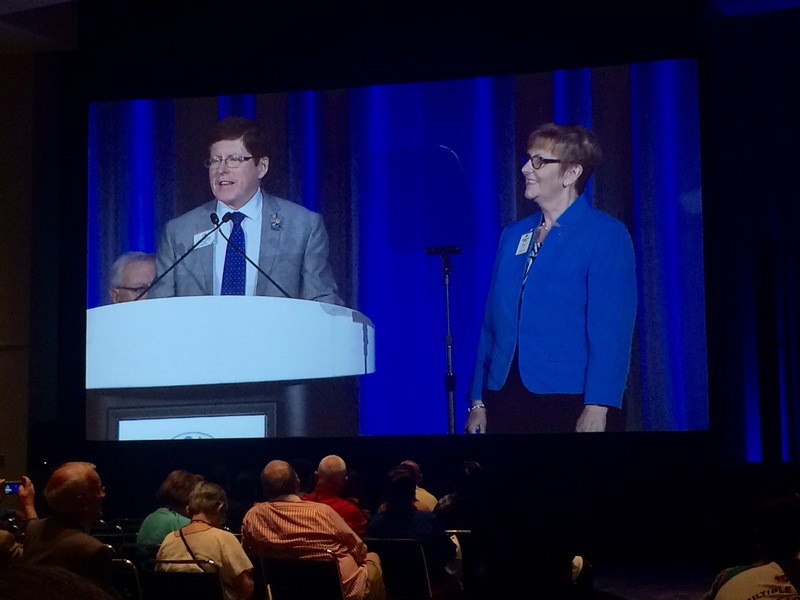 ID-Elect Pat was poised, effective, and well-received by the delegates! ID-Elect Pat started her activities with a candidate’s breakfast on Friday, June 30, where she was introduced to the other candidates and approved to move forward for election. Later, she attended the nomination committee meeting to draw for her place on the ballot. She was listed as the second candidate out of six running to represent the United States. Having fun greeting the crowds at the parade. 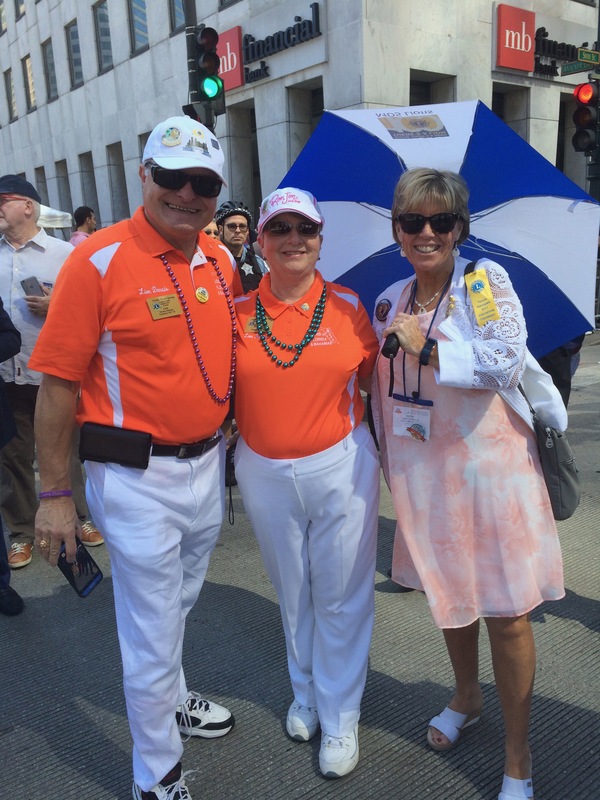 Our Oviedo-Winter Springs (FL) Lions President Dennis and Lion Nancy Dulniak with Lion Kathy at the parade. 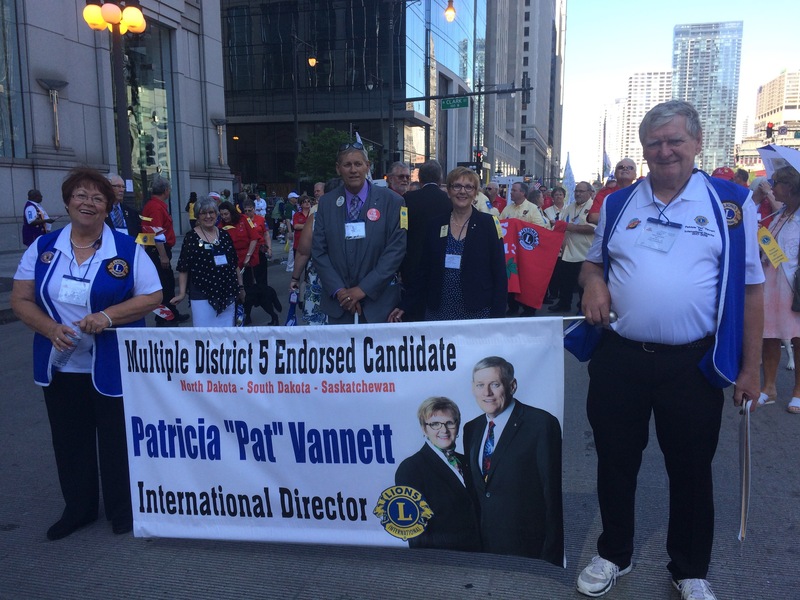 PDG Judy and Lion Mac Beaudry carry the banner for ID-Elect Pat and PDG Kevin Vannett. 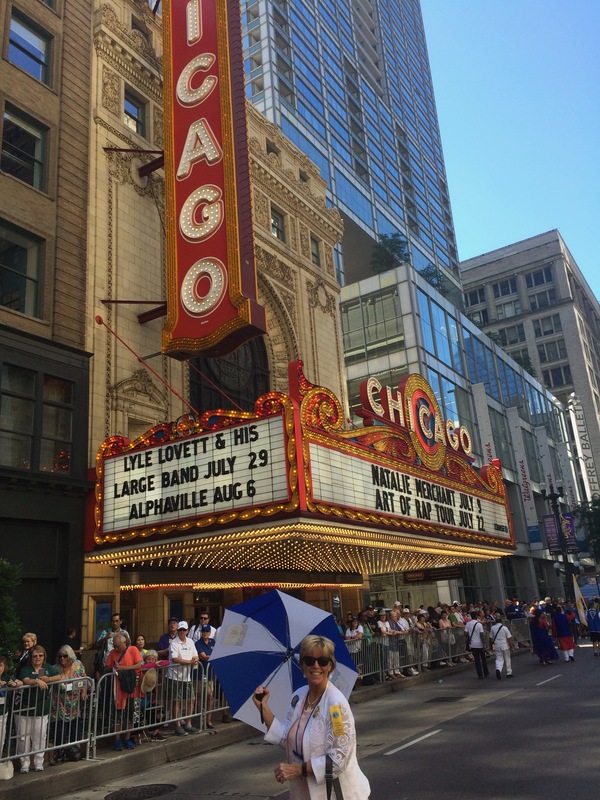 Lion Kathy in historic downtown Chicago! 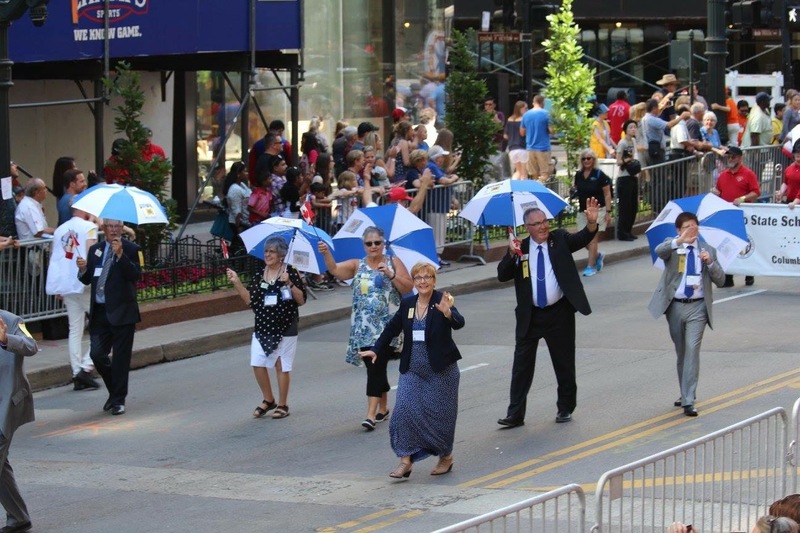 On Saturday morning, the International Parade took the delegates down State Street with thousands of citizens from Chicago and many of the 30,000+ Lions in attendance watching from along the street. 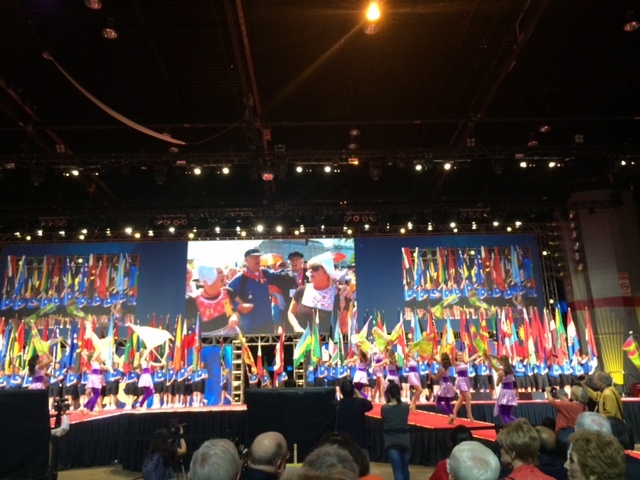 MD5 members of the International Family supporting ID candidate PDG Lion Pat Vannett in the parade of nations. MD5 had a marching band from Minnesota leading the delegation, followed by the District Governor-Elects carrying the flags, and Lions from MD5, our candidate and spouse, and the Past International Directors from MD5 (IPID Robert and Kathy Littlefield, PID Marvin and Lynne Chambers, and PID Garnet and Mary Ellen Davis). 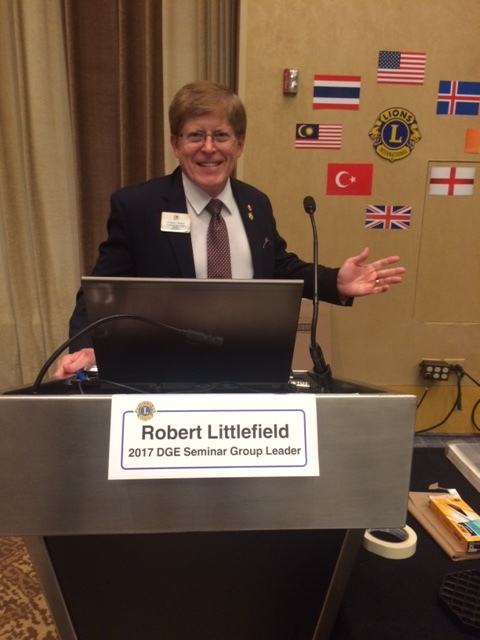 In Toronto, PDG Pat placed candidate PCC Robert’s name into nomination for ID; in Chicago, PID Robert returned the favor for candidate Pat! What a thrill! 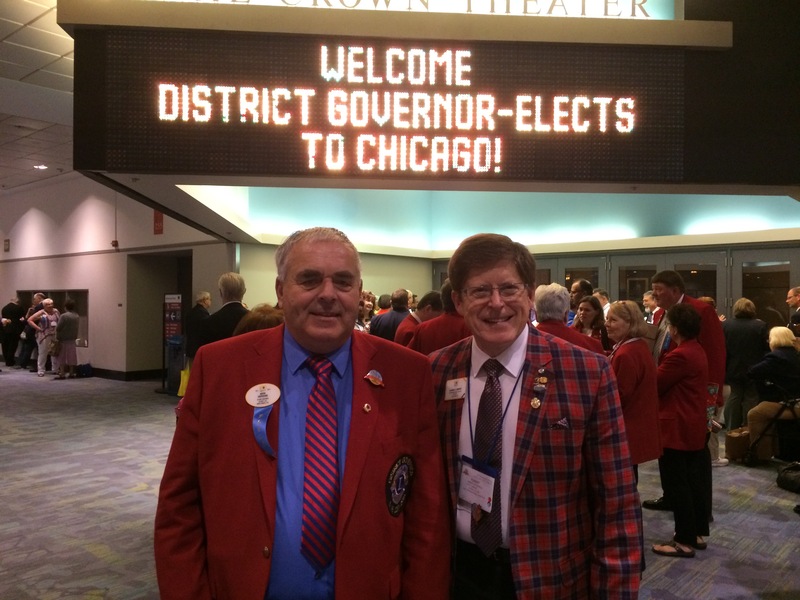 Later that day, it was my honor to introduce and second the nomination from the Nomination Committee to elect PDG Pat Vannett to the Board of Directors. 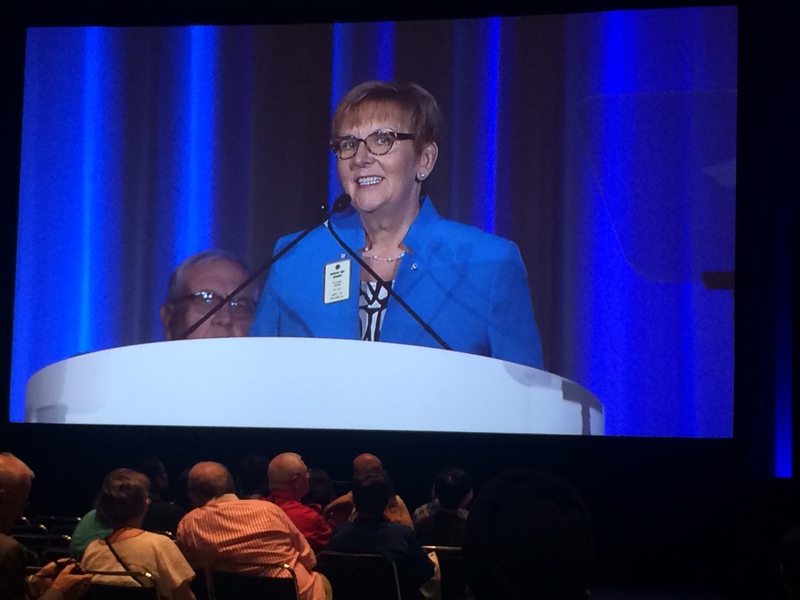 PDG Pat accepted the nomination and promised that she and PDG Kevin would be dedicated representatives on the board of directors. On the Fourth of July, International Director Pat Vannett was sworn into office with new LCI President Naresh Aggarwal presiding. ID Pat will serve on the Finance and Operations Committee, overseeing all funding for the association. 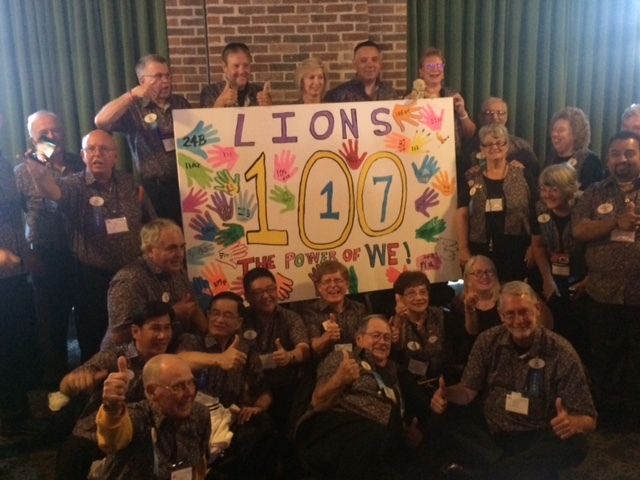 Lions from MD5 can count on ID Pat to work hard for our association as the second century of Lionism begins. 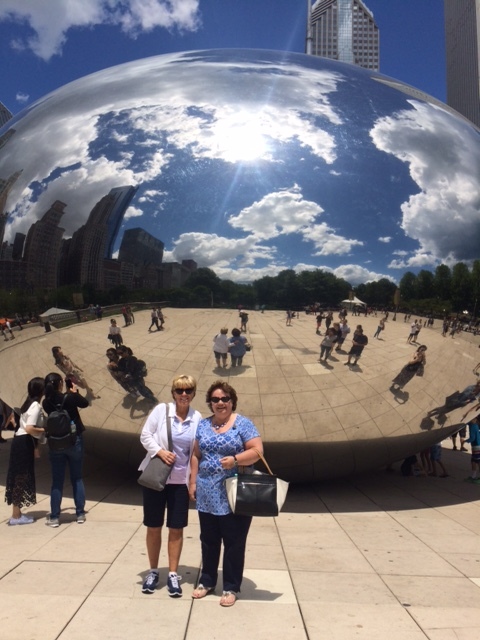 Lion Kathy and Lion Elaine at the Chicago Bean. 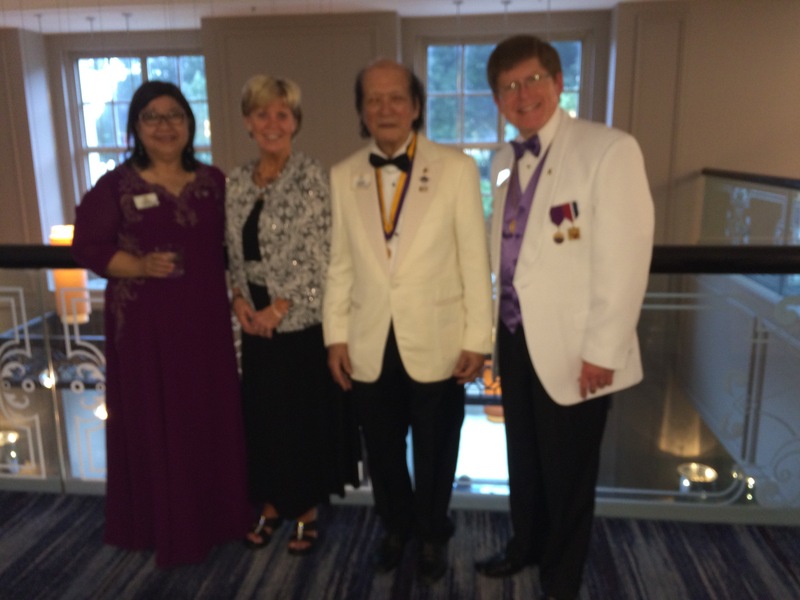 Lion Dora Chan, Lion Kathy, PID Charlie Chan, and PID Robert before the banquet. 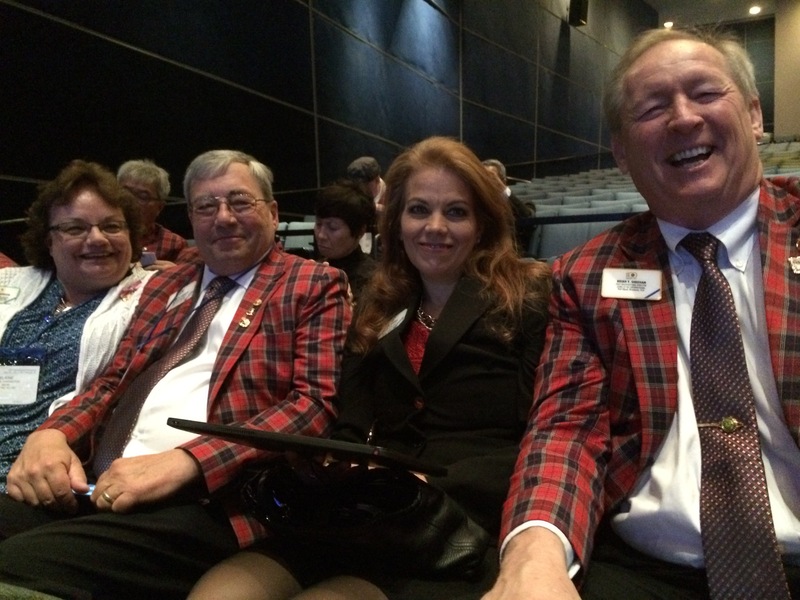 Farringtons and Sheehans at the DGE opening general session. Throughout the convention, the plenary sessions, seminars, training sessions, international shows, and other events were fast-paced and exciting. 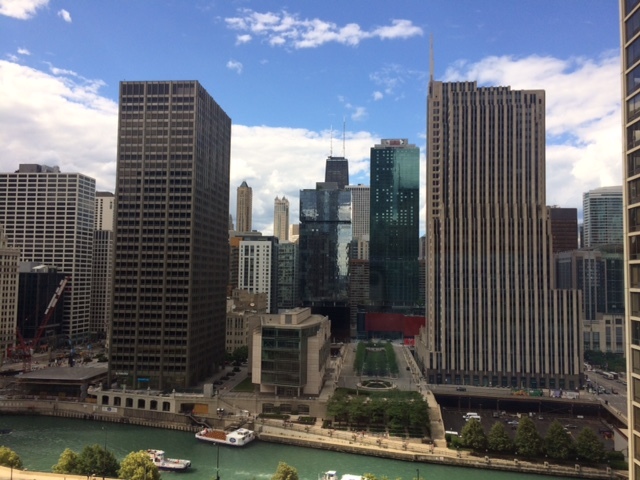 The timing of the convention with the Fourth of July weekend resulted in many evenings where fireworks filled the skies. But, for Lion Kathy and me, reuniting with special friends provided the icing on the cake. 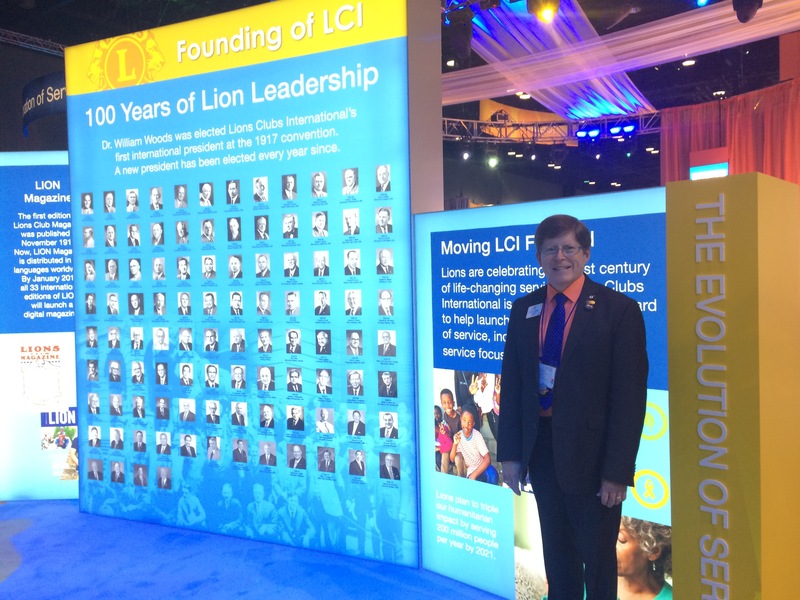 Twelve of the 16 International Directors from 2014-2016 were on hand to celebrate the 100th Birthday of LCI. We came together from New Zealand, Singapore, Argentina, India, and the USA. US IDs and spouses (with adopted Eric and Karen Carter from New Zealand) from the class of 2014-2016 with President-Elect Naresh and Lion Navita Aggarwal and the banquet. 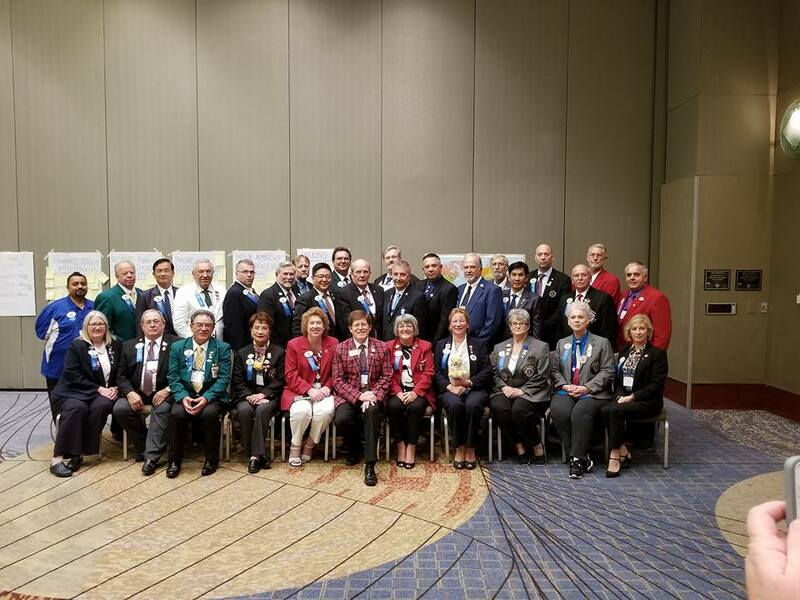 Lion Kathy and I enjoyed reminiscing about the past with Past International Presidents, current executive officers, Past International Directors, and the current Board. The LCI staff was fabulous, bringing everything the Centennial Planning Committee conceived into reality for the convention participants. But, there are two Lions on the pin—one looking to the past, the other looking to the future—and the excitement of starting a second century of service was contagious. 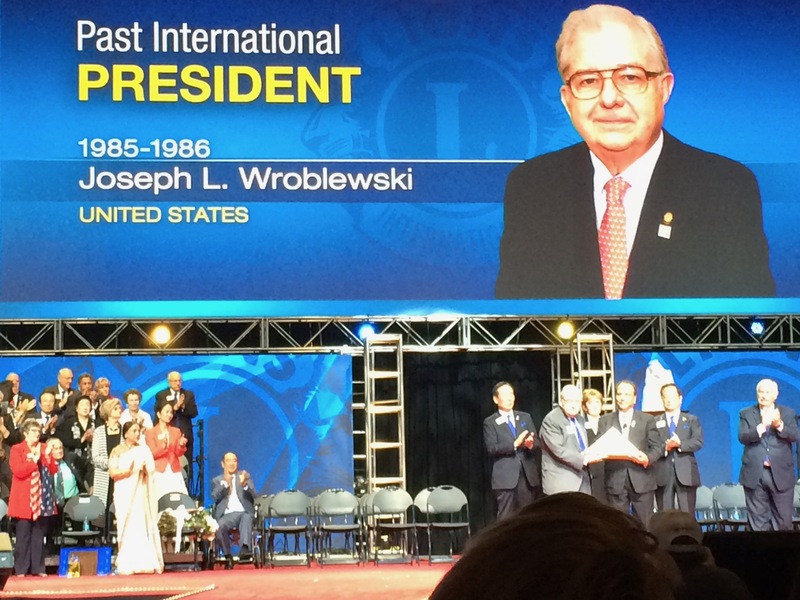 Imagine what it must have been like to be a founder of Lions Clubs International in 1917. Could those early leaders have imagined the impact their efforts would have on the world? 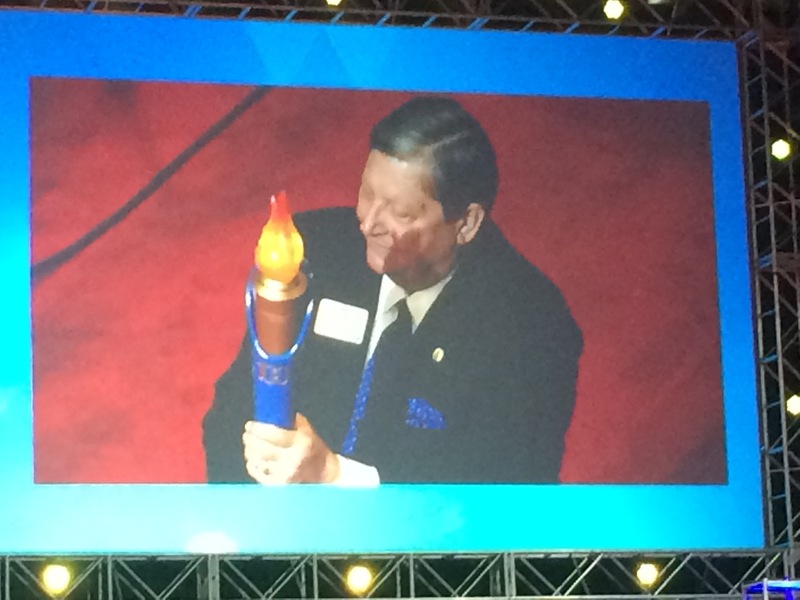 Centennial Committee Chairperson PIP Frank Moore leads the ceremony to extinguish the centennial convention flame and send the light of Lionism out to the world in the hands of the Leos and youth–the future leaders of LCI. As Lion Kathy and I left the convention, we found ourselves thinking of the next 100 years and beyond. We have the opportunity to help shape the second century of service; and we are committed to doing our best to make a difference in the world. Now it’s time to complete a project that has been several years in the making—my personal legacy project for Lions Clubs International—a book commemorating the role of service in the lives of those who serve. Entitled Stories from the Heart: The Role of Service in Lionism, the book includes content describing what motivates people to serve the needs of others and 100 personal stories shared by Lions from around the world describing when they knew in the hearts they would be a Lion for life. 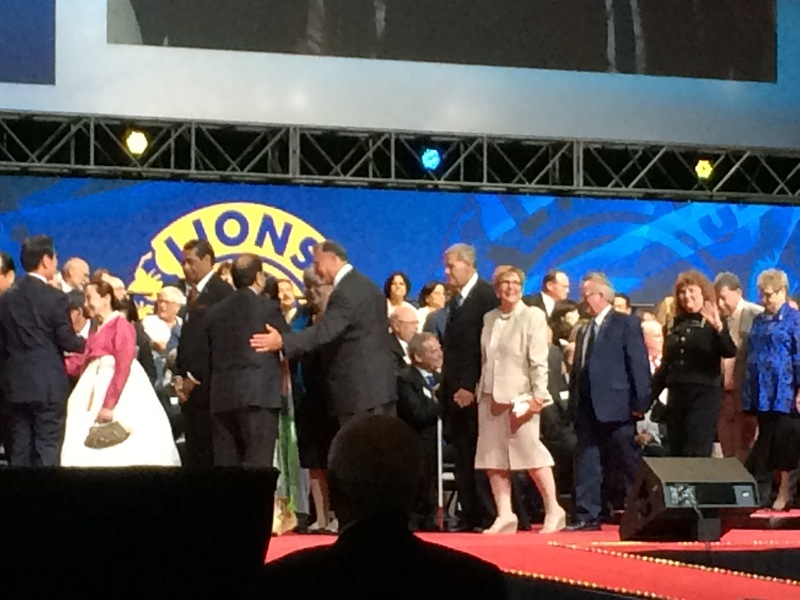 International President Naresh Aggarwal presented his Presidential Medal to the DGE Group Leaders for their role in training the first District Governors of the 2nd Century of Lionism. You’ll hear more about the book in the coming months when it goes to press, so watch for details in upcoming messages. Until then . . .
Best wishes to those who serve!